GREAT NEWS! Wes received the gift of life – a new kidney – on November 3, 2015 from our family friend, Hollie Bragg. They are both doing well and we are so grateful for her life-saving gift. Keep checking back for updates. Wade Edward Sparrowhawk Smith, known by family and friends as Wes, is a wonderful, happy little eight year old boy. Wes was born in April 2007 with the genetic disorder Williams Syndrome and without his right hand. At the age of three months, Wes had open heart surgery to enlarge his pulmonary arteries and repair a valve in his heart. Over the years Wes has struggled with various developmental delays and did not walk until just before his fourth birthday. Despite all of his challenges he has remained a shining light of joy to everyone who knows him. His upbeat personality, ready smile and infectious laugh have captivated all who know him. In November of 2011, after a weekend visiting friends and horseback riding during Thanksgiving break, Wes was struck down by sudden onset kidney disease—Focal Segmented Glomerular Nephritis (FSGS), collapsing form. After seven months of treatments and despite repeated hospitalizations as well as outpatient treatments, Wes’ kidneys have all but stopped functioning. Now, Wes needs a live-saving kidney transplant. Research has found that with FSGS there is a better chance of survival if a transplant can be done before needing to start dialysis. Wes must receive a transplant we hope that match can quickly be found! Even with insurance, Wes’ transplant and care is going to be extremely expensive. He has undergone the transplant at the Children’s Hospital in Pittsburgh. Along with the travel and relocation to be near the transplant center, there are also co-pays, deductibles, doctor visits, and the costly anti-rejection medications he will have to take for the rest of his life. All of this presents a challenge we cannot meet without your help. In order to ease the financial burden, a fundraising campaign in Wes’ honor has been established with HelpHOPELive, a nonprofit organization that has been assisting the transplant community for over 30 years. All donations are tax deductible, are held by HelpHOPELive in the Mid-Atlantic Liver Transplant Fund, and are administered by HelpHOPELive for transplant-related expenses only. Please consider making a contribution.Thank you for your generosity and support. Well everybody, I know this is pretty soon for another update, but Wes was admitted into Childrens Hospital of Pittsburgh today. His BUN, Creatinine, Potassium and Bp are all elevated, however, his Prograff levels are where they need to be (Prograff is the anti-rejection medication). Anyway, they aren’t sure what is going on, because the Prograff levels have always been right because we have never missed a dose. He has to have a biopsy tomorrow on the new kidney. We are praying it is not the FSGS returning because that is what killed his kidneys in the first place. So, if you pray, then please say a prayer for Wes. the latest on Wes is that he seems to be doing really well, except his BUN and Creatinin have been slightly elevated lately, so we are keeping a close eye on this, as it may indicate problems. However, no panic yet, just watchful eyes. Wes has gained so much height and weight that he is upgrading to the next size of clothes faster than expected! However, this is so awesome that we really are NOT complaining. As usual, I want to thank everyone for their kind, helping donations! Just thought I would share a THEN and NOW picture to everybody. Your donations HELPED!!! And any continuing donations will also help. We still have big bills to pay, and his medications cost over $2,000 a month, and no, Medicare/Medicaid does NOT cover it all, the funds from Medicare eventually run out, so will will need help with his medications soon. Thank you SO MUCH everyone who has prayed for Wes and donated to his fund. Because of YOU we are making it! Wes is doing GREAT! He is down to clinic visits every 2 months with labs in between. And WOW had he grown! I can’t keep up! He has grown 5 inches and gained almost 20 lbs since the transplant! Thank goodness for cousins who can hand their old clothes over to him or I couldn’t keep him clothed! On other news, unfortunately I lost my job 🙁 so I am trying to find a new job. It has been rough, we managed 2 months before our emergency funds ran out. Thank goodness for unemployment. On brighter side, I have a job interview Tuesday and the prospect looks great! We are praying I get this job because it is a great opportunity, better pay, my field and would be a great place to retire from. thank goodness for HHL because they have made it possible for us to stay on top of household bills during everything! UPDATE!!! It is 2 weeks and 2 days post transplant! Wes is doing GREAT! I can’t believe how fast he is recovering. Within days he was up and moving, a few more days later and he was unhooked from everything and allowed to shoot hoops, visit the hospital play rooms, participate in the Child Life activities and be a kid! No more dialysis! We made our first trip back to Pittsburgh Children’s Hospital yesterday for his anti-rejection medication levels. Wes himself can’t believe his good fortune at not having to do dialysis. He clapped and cheered when we reassured him that NO, he would NOT have to do dialysis! Of course we are careful to make sure he get’s his meds EXACTLY when he needs to and EXACTLY what they tell us he needs. We are traveling 2 days a week for his Prograff (anti-rejection med) levels so we are EXTREMELY thankful for HelpHOPELive and to all of the donors who helped bring Wes’s campaign to it’s current level. he is doing great! They are talking of releasing him Wednesday! Here we are, up at Pittsburgh Childrens Hospital – UPMC….Transplant tomorrow at 7am. 8 days and counting. 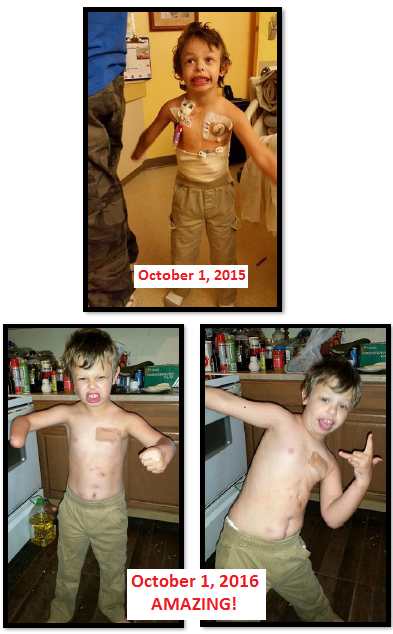 Wes has 8 days, 3 dialysis trips, 2 days of school, trunk or treat and trick or treat before his transplant. Thank you everyone for you continued support. Special thanks to the Native Community that continues to give so generously and to Peacemaker and family for their continued help. Well, Wes had another two surgeries, he had to have his PD catheter replaced, and they put in a permanent hemodialysis port for him until his transplant. He also had a g-tube put in because of his hair trigger overflow (i.e. puke) valve, to keep meds and nutrition down. We have a tentative date of November 3rd for his transplant…don’t have formal verification yet, but we have our fingers crossed. Thank you EVERYONE for your help, your donations and your prayers…even though we have met our goal, we also understand that fund raising will be a continuous thing over the years for his meds and doctor trips etc. Update on WES: Wes is back at WVU-Childrens Hospital at least until Monday. They will be doing X-rays etc to make sure that his P-D catheter is positioned correctly in his abdomen and also checking for a hernia…as either of those requires surgery. Also his Dr. is going to try to adjust his dialysis to maximize effectiveness AND comfort. So this weekend is going to be a rough one on us, since the dialysis is causing him so much pain…I just hope it doesn’t get worse before it gets better. On another frustrating note, I got a msg from his Transplant coordinator from Pittsburgh Childrens that he needs either to have the MMR or a vaccination record that shows that he got it. I checked his online record, and couldn’t find and MMR vaccination beyond his baby one. He should have had a booster between 4 and 6…well I think he got it before going to kindergarten, but I can’t find a record anywhere. In either case, if he has to get an MMR then we have to wait a minimum of 4 weeks before they can transplant! sheesh. Also, they need clearance from his dentist…FROM HIS DENTIST!??!?!?!?! They need to know he doesn’t have any major dental issues. Really? Could they NOT have told us MONTHS ago? Thank you Church of Christ, Beverly Pike & Bridge St, Belington WV for your generous contribution! Yesterday, August 11th, we had our last visit to Pittsburgh Children’s Hospital before surgery. Yes, before transplant surgery. They gave him a 45 day wrist band for his blood type/cross match information so that when he comes in for the surgery they don’t have to do all the blood work again. So what does that mean? We have live donor match, we have the thumbs up for the surgery, so sometime in the next 45 days he will be scheduled for, and have, his kidney transplant! Until then we keep him on his nightly dialysis routine and keep him as healthy as possible to reduce any additional complications!!! I am nervous, excited, worried, relieved and thankful. We have nearly enough funds in his transplant campaign and more is coming. I would love it if we could reach beyond our initial goal of $30,000 because that was our rock bottom figure for being able to finance all of the out of pocket expenses. There is a softball tournament coming up the last of August to fund raise in Richwood WV, and a local Church of Christ has committed to donate at least $2,000 and we have a 2nd hand promise of another $2,000 from a restaurant. 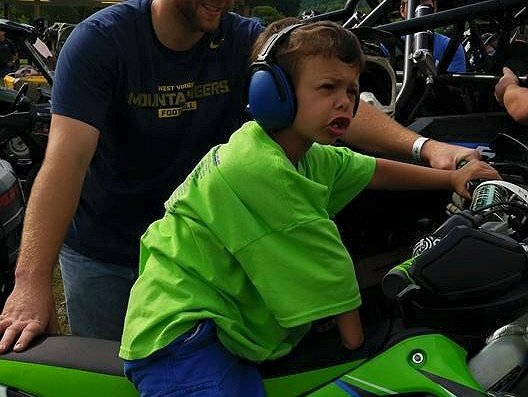 The ATV/UTV/DIRTBIKE Benefit raised over $5,000 but it isn’t showing yet on the Fundraising Indicator but once it has reached HHL offices and is applied, you will see us over $26,000. THANK YOU everyone! YOU are making this possible! We had SO MUCH FUN on the ride today! We were muddy from head to toe!!!! Wes came home, ate more food, then passed out in daddy’s chair. Mike (daddy) is laid out on the sofa. Pictures in a bit! THANK YOU EVERYONE who rode today!!!! Thank you for your support!!!!!! I think we will make Wes’s goal and then some!!! WHOOP WHOOP!!! GREAT NEWS! We have a group of mudders having an ATV/UTV/DIRTBIKE Benefit ride in honor of Wes!!!! If you want to ride, you can register below. If you just want to donate, you can do that too. Just click Register! MAKE IT VIRAL — for those of you who received Mel’s eblast today re the Make it Viral for Wes day, please click the green register button below this notice to make your generous donation. Together we can make a difference for Wes. Many thanks. UPDATE!!!! June 7, 2015….”Whoop whoop folks….we have a compatible person!!!!!! All they have to do to finalize is pass a GSR test (kidney fxn test). Wes has to have a CT scan of his thoracic aorta (?) also….we ARE looking at transplant as early as mid-August!!!!!! We Need to get the HelpHopeLive fund upupup!!! they may have other questions for you. My husband and I have both offered, and will be tested when we have our appointment, however, it is unlikely that we will even be allowed to donate because of our personal health issues. So please, if you have mentioned at any time that you would be willing to donate, please call THE NUMBER ABOVE not me. They will work out arrangements for you to be tested. I think they may also help with travel arrangements if needed, but I am not 100% on that. Well today Wes turns 8. It’s hard to believe that 3 years and 5 months ago we didn’t even know for sure that he would make it to his 5th birthday. Here’s to beating the odds!!! Wes has been home since Monday and loving every minute of it. He’s not quite back up to par yet, but getting there. Monday we start dialysis training for 4 days at the dialysis center and then the last day at home. We are entering a new and scary phase of this journey. Dialysis stands between Wes and death, that is the hard truth of it…at least until he can get a kidney. We’ve known this day was coming. We knew it 3 years and 5 months ago. Wes even beat his doctors expectations! His wonderful AWESOME doctor, only gave Wes a year before needing dialysis, instead, we got 3+. Amazing. Even Dr Onder celebrated the extra time we got. I can’t praise Dr. Onder and WVU Children’s Hospital enough! The hospital has saved Wes’s life so many times and with Dr. Onder’s tenacity and constant involvement our little man has had a chance to grow and play for the last 3 years. I was hoping we would be able to have a pre-emptive transplant, that Wes would not have to go through dialysis, but it wasn’t to be so. That is OK, we have our boy! The nice thing about peritoneal dialysis is that he get’s hooked up at night but get’s to just be a kid during the day. Daily dialysis without the roller coaster ride of hemodialysis every other day…the ups and downs of feeling bad one day and good the next. This will give Wes a stability, a continuity, that he can adjust to. After spending 3 weeks in the hospital, and seeing just how easy peritoneal dialysis is for the operator (Mom and Dad) I think we can even manage family vacation. We’ll have to take almost a truckload of supplies with us, but still, we want to keep things as normal as possible for our little guy. I just want to thank everybody AGAIN for the donations to his fund, the love, the help and the cheers! Sharing this again with everybody!!!! We are getting the house ready for the dialysis. We received a shipment of 8 boxes of dialysis supplies Tuesday and the delivery company said “to get you through the end of the month”. Really? OMG how many boxes will a whole month be? And it dawned on me….we are going to double our monthly trash bill! All those empty boxes, all those used fluid bags, wow. So anyway, enough reality for now, TOMORROW IS WES’S 8TH BIRTHDAY!!!!! Please send a birthday wish to Wes! Week three in the hospital. Peritoneal dialysis is working, we are learning, but still have not been trained. This is very frustrating, I just wish we could take him home and doing dialysis at home. This is expensive living at the hospital and at home. It takes about $100 a week to feed us (only one of us stays at a time) an entire week. I can feed my whole family for a week on $100. Wes is doing pretty good, though he says the fill and drain cycles hurt, especially the drain cycle. I think I am depressed. Wes had a visit in PICU from the Easter Bunny today. Hopefully today he gets to go to the playroom today. If his Bp can come down and he has another round of dialysis he get’s to go play. Thank you everyone for your continued support and prayers! Today is April Fools day…and it’s no foolin’ we are still in the hospital. TodayWade will have surgery to put in the hemodialysis port and the peritoneal dialysis port. We had a rough night — Wes had leg cramps and was feeling scared. This morning he seems more himself and is happily watching Cars. He wants food and drink but he is NPO today. UPDATE on WES: Well he is settled into the PICU at Ruby Memorial. Tomorrow morning is his surgery to implant whatever port they need for Hemodialysis. He will have a a day or two or three (don’t know yet, depends on blood works) then surgery again and they will implant whatever port or tube they need for the peritoneal dialysis. Hopefully (fingers crossed) he will make it home this weekend. Then a week or so healing time. Then Mike and I need to do 4 days of dialysis training so that we can run his dialysis from home at night while he sleeps. Some adjusting to do. Going to have to figure out how we are going to manage his dialysis machine in his bedroom because he doesn’t have any sockets that work. Mike stayed up at Ruby with Wes. If you have Mikes number and want to call him, I am sure he would appreciate it. We appreciate any prayers, and once again thank you for holding us in your prayers and thank you to all of those who have been donating to Wes’s transplant fund…we’re going to need it soon. Well, it’s been a few years since we started down this path. November 2011 seems like just yesterday yet so long ago. Long enough for us to get as used to this as possible, long enough to forget to worry 24/7, long enough to consider it just “part of our life”. Well, 4 years and 4 months later and we are getting ready to have “the meeting”. You see, Wes’s kidneys are getting worse. It’s been a rough winter and having the Flu in January absolutely did not help. He spent 5 days in the hospital. For the last three days school has been telling us he has been sleeping in school, hasn’t been eating and finally, today they sent him home. Time to start dialysis? Probably. We FINALLY get him off liquid meds and on to pills! We celebrated…but he’s just not doing well. Pray for him, pray for us. He needs his kidney, he needs our help, he needs funding. He is the joy of my life, and it is so hard to see him feeling so poorly right now. Pray. Hi everybody! Wes is doing pretty good right now and is stable! That is a great relief! We are anticipating the holidays and preparations. Wes LOVES helping me make cookies. Wes has finally learned how to do armpit farts to his utter joy (and my dismay!). Now he is working on learning to whistle. He is persistent, once he decides to learn something he works at it until he does! I hope everybody is participating in #unselfie day and #givingtuesday for HelpHopeLive! have a great day and a wonderful holiday season! Well it’s a new school year. Wes went into 2nd grade. It’s amazing to me how fast he’s growing. We took a family vacation at Cedar Point and Wes was finally tall enough to ride 2 roller coasters! He’s still holding at stage 4 kidney failure, and we’ve only had 2 hospitalizations this year. You never quite get used to the idea that someday he will need a kidney transplant, and the daily routine of medications, making sure he is well hydrated, while also dealing with his umpteen zillion doctors appointment. He is the bravest, most resilient kid I know. I’m for TEAM WES! Thankyou thankyou thankyou. Annonymous donor from heaven!!! We love you!!! Updated Wes’s pic today to one closer to his age. This was from several months ago when Wes was still having infusions for his anemia. Well Wes is hanging in there this winter. We’re keeping our fingers crossed that he doesn’t get any stomach bugs!!!! We are looking forward to spring and summer…we’ve had a lot of snow! Again thank you everyone for your donations and for loving Wes! Got some new pics of Wes at his last infusion! Literally his LAST infusion! After about 7 months of fighting anemia his hemoglobin is FINALLY about 11!!!! Still getting procrit shots each week and taking an iron supplement…but no infusions!!! WHOOOOPWHOOP! Personally I am looking forward to Christmas/New Years break to spend time with the kids. Well today Wes turned 6 years old! Our little man is growing up! Wes started growth hormone therapy about 3 weeks ago and is finally adjusting to the daily shots. He is still at stage 4 kidney failure, holding at about 15% to 17% kidney function. Doctor doesn’t want him to travel out of state though, bums us all out. I have to go to Florida next weekend and really wished I could have taken everyone with me, it would have been a nice break…if somewhat rushed…family trip. Anyway, Wes’s party will be Sunday at the park with the Chemistry department from work and Benzene Ring (Chemistry club) and Chem students. Should be fun! We’re still struggling trying to raise funds for Wes, it seems people just can’t afford, in this economy, to give. However, THANK YOU EVERYONE who has donated so far!!!!!! Have a great day and celebrate because you helped our little boy make it to 6 and every year after!!!! Great big love! Took the kids Trick or Treating tonight….Trick or Treat was delayed by Hurricane Sandy blizzard and recovery. Wes went as one of the Tractors from the tractor tippin’ scene in Cars. Check out the photo’s on the photo page! Well it’s been a rough time in the past couple weeks. That Hurricane Sandy really did a number on us! We ended up taking a couple days in a hotel which we really couldn’t afford. We were without power for so long…it was cold, dark and miserable. We were exhausted so on payday…we got a room. We were cramped, but we had electric, heat, TV, Internet a mini-fridge, a microwave and a coffee pot. To us, it was a much needed respite. Came back home on Sunday when the electric returned. I just got onto Wes’s HHL fund raising site and saw GREEN…I was amazed….you can actually see GREEN at the bottom of his thermometer. We are finally at the “0” mark. Thank you EVERYONE and EVERY ORGANIZATION that has been working to raise funds for Wes! God bless you! Wow! Wes was referred to Make A Wish foundation….got a letter in the mail today and Wes is granted a wish…he get’s to meet Lighning McQueen, Mater and all his Pixar faves! Uncle Spence loves you and is so greatful to the Great Mystery that you are getting the kidney you need. Remind Mommy to call if there is anything we can do to help. Wes we are so privileged to have you come into our lives and inspire us to enjoy the life we are given. You are truly an amazing young man. We enjoyed having you along on the benefit ride and we hope the money we raised helped! We love you buddy! My husband go his kidney in 2006. it is working good today. I have to say listen to the doctors. get you blood work done. keep all his meds on time every day. One hint please done run out of his meds. If the doctor went original meds for him that the doctor has to writ on the med original not name brand. If he has other med that is on time schedule might have to add the new pills to them. I am praying for him. Love and prayer. Will share with the rest of Keepers of of the Word. Lots of love and prayers always for you all. I know that you will be feeling better very soon! Prayers to you and your family! Best wishes Wes! From Meg & Thierry part of your powwow family. I think we all can make a difference..Good Luck little guy!!! Hey Wes!! I'm so excited and so happy that you are about to get your new kidney! You will feel so good and have so much energy!! Mom and Dad won't be able to keep up with you! :-) Love you bunches! Get well soon I loce you. Feel better Wes Loce ya!! Aunt Rainie love's u !! You guys are doing an awesome job keep up the great work. Hi Wes. My daughter worked for you Mom while she was in college. She met your sister about a day after she was born! I only know you through talking to your Mom on Facebook, but I know you're a strong fighter. So, keep it up. I look for news about you every day. If you have to come to Children's Hospital in Pittsburgh, you're invited to come to my house. Keep smiling and get lots of playroom time. Wes, your powwow family is thinking of you everyday! Hang in there little dancer! Many hugs! Hey Wessers!! Nana Janie and Pap John love you very much! I hope you are feeling ok right now. You keep smiling buddy and keep flirting with those nurses! we love you and hope that you come home soon. Our family is praying for you and your family. We hope you come home soon. My son was born with WS as well and had serious heart defects. He spent three months I'm the hospital. My best advice for making it through is to take at least an hour every day and get out to do something. Go for a walk, get coffee, window shop, but you must get out of the hospital. It is imperative to your sanity and helps prevent depression. The nurses told me it's called PICU syndrome. I pray for both of you to find strength to make it through. You can do this. Hugs dear. I just thought this was a cute picture of Wes being a wonderful little trooper! Hi Wes! Hope yo have a Merry Christmas and my family will keep you and your family in our prayers! Maybe someday you will get to visit me way up north! I wish you good health. You are a cute pie. Have good christmas. I talk to santa claus today. He said he be at your house on christmas eve.happy christmas and new year. I hope for good 2014 year foryou and your family. Wes you were the best Ring Bearer ever! You made our Wedding Day bubble over with JOY! Hang in there and don't ever give up! We all LOVE YOU VERY MUCH!! Hey baby boy, hang in there! You are doing great and mommy is so proud of you! HAPPY BIRTHDAY WES!!! Today you are 6! Love you, Wesser! Let's go ride Alfie again when the weather gets warm. You are getting so big! Maybe next year, you can hold the reins!!! Hi everybody! Give a shout out for Wes! Wes had a grand time at the Poker Run Saturday, thank you Order of the Eagle/Charleston and Eagle Riders!!! Not only is Wes in my prayers daily but the whole family also, he is such a little sweetheart! Thinking of you and keeping you in my prayers. I am Nancy Harper's sister. We're back from Wes's Make A Wish - Wish trip to Florida. the Make A Wish foundation and Give Kids The World are incredible!!! If you want to see pics, go to Wades' facebook page! thank you again everyone!!!! thank you so much! Wade, good luck. thinking of you and your family! Mel, just posted to my FB wall. Will do so periodically! Greetings to all who visit Wes's page! Thank you for coming! Please keep Wes in your thoughts and prayers as we go through the process of a kidney transplant. Thank you for your help!